There’s always something fun to see or do in Edmonton—including catching a broadway show! One of my favourite musicals, The Book of Mormon, is coming back to Edmonton this September 18-23 at the Northern Jubilee Auditorium, and I’ve partnered with Broadway Across Canada to give away dinner and tickets to the show! The Book of Mormon plays in Edmonton Sept. 18-23, 2018. 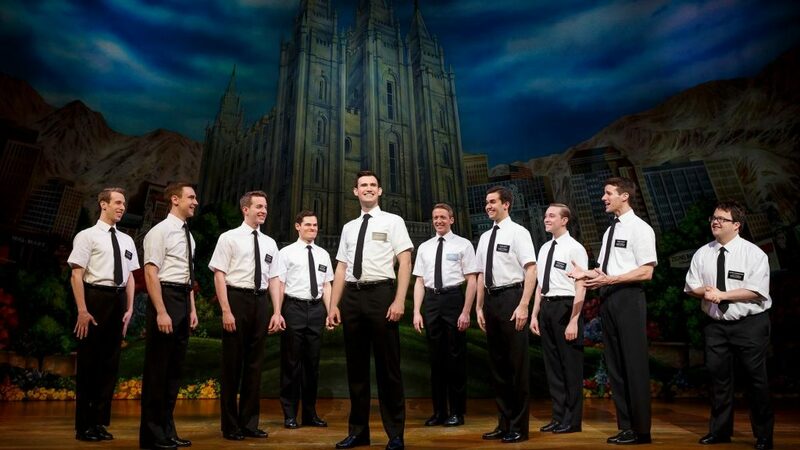 The Book of Mormon is a hilarious musical comedy that will have you laughing and singing along. Written by the creators of South Park, The Book of Mormon tells the story of two young Mormon missionaries who travel to Uganda to preach the Mormon religion. The musical pokes fun at religious beliefs and practices, and could be described as pretty offensive, but really funny. It features a bunch of catchy songs (including Hello! ), and is ultimately a story about faith, hope, and change for good. The Book of Mormon has won 9 Tony Awards including Best Musical, and there’s a reason Broadway Across Canada brings it back to Edmonton every few years—it’s so good! 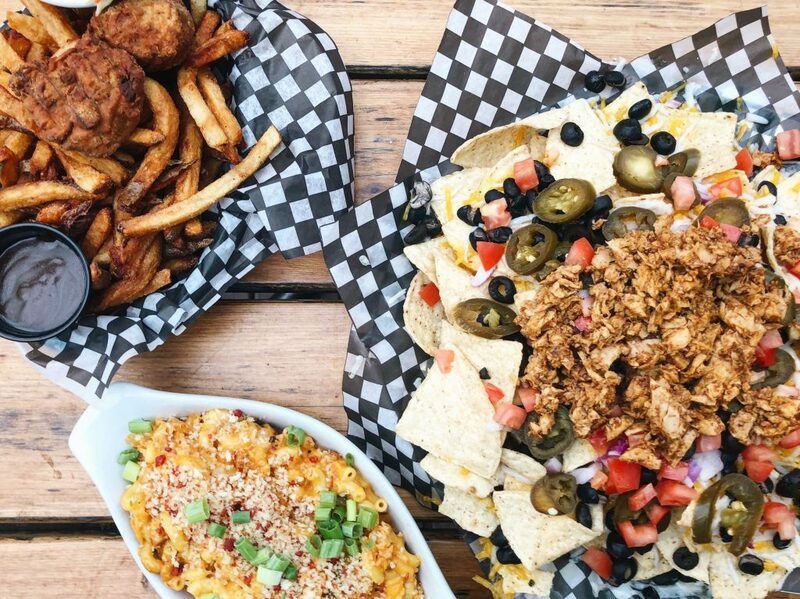 I’m excited to give away tickets to the show, and dinner beforehand at The Buckingham on Whyte—where you can try their all-vegan menu by the talented folks of the former Sailin’ On Food Truck. Vegan spread at The Buckingham on Whyte! To prep for this post, Mike and I went to try The Buckingham’s nachos (featuring a vegan cheese blend, pickled jalapenos, diced onions, olives, diced tomatos, black beans, and our choice of two dips—red salsa and sour cream), Buffalo ‘chicken’ Mac ‘n Cheese (with elbow macaroni, vegan cheese blend, buffalo ‘chicken’ (protein), onions and celerey, and a panko crumble, and their Fried ‘Chicken’ with fries and slaw. Grab dinner for two at The Buckingham on Whyte before the show on Sept. 18, 2018. I’ll pick a winner out of all entries received on my Facebook, Twitter and Instagram by Sept. 14. Enter on all 3 platforms for more chances to win! Note: the tickets are for the Sept. 18 evening show so make sure you can make that one before you enter. Dinner includes one appetizer and two entrees at The Buckingham on Whyte. Disclaimer: Broadway Across Canada partnered with me to give away a pair of tickets to The Book of Mormon, as well as dinner before the show at The Buckingham on Whyte. My meal at The Buckingham on Whyte was complimentary for the giveaway. This has no impact on opinions stated in this post. The Book of Mormon is an awesome musical and The Buckingham has a pretty wide vegan menu.